45 universities in Korea are opening their gates to international students. These schools emphasize that students will get opportunities to learn about Korean culture, not to mention the major fields. 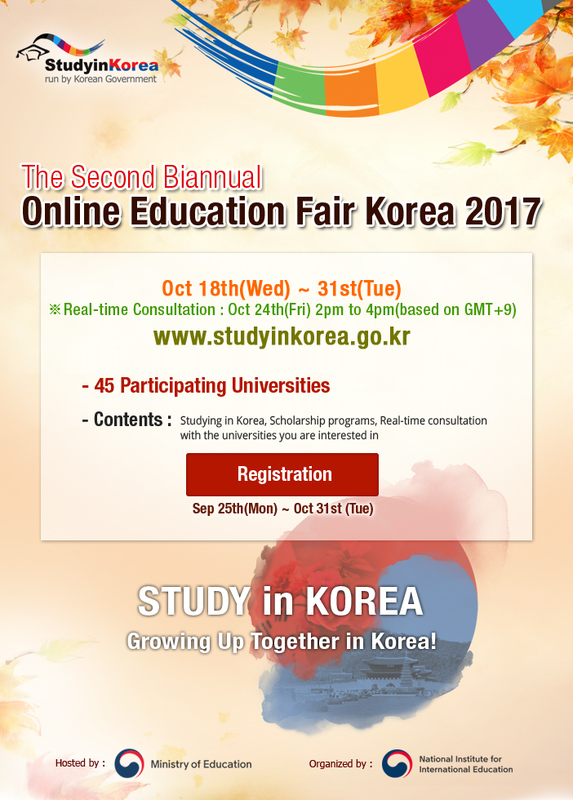 Hosted by Ministry of Education and organized by National Institute for International Education of Korea, Online Education Fair Korea 2017 is to be held from October 18 to October 31. The online fair is organized to provide information for international students about college education in Korea. Through the event, one can learn details about attending a Korean university as an international student. The website provides detailed information about application process, scholarship opportunities, career developments, and even more. The Korean government has provided scholarships to more than six thousand international students since 1967. The scholarship opportunities are not limited to those from the government, as a number of universities, foundations, and companies offer financial support programs as well. Students can also ask for further information from the real-time consultation session with universities they’re interested in. The consultation session will be held for two hours from 2 PM on October 24. If you’re interested in the event, visit the website to learn more about it and register online. The registration will stay open until October 31.